The Goo Gone's line of products is a trusted brand, we stand by our products for all of your dirty, sticky, messes. Safe for you, your surfaces and your home! Please explore our line of Goo Gone Original, Pro-Power, All Purpose, Sticker Lifter, Spray Gel, Patio, Grill, Oven, Automotive, Tile & Grout, Clean Up Wipes, Kitchen Degreasers, Paint and more! There are so many ways to remove tough messes with Goo Gone Products. Specifically formulated with Citrus Power, Goo Gone s portfolio of products effortlessly cleans up stains and sticky messes around your entire home. From gum to grease, fabric to fiberglass, you can count on Goo Gone to safely remove almost any problem and restore your surfaces to their original condition. If you can t undo it, un-goo it. Remove sticky, greasy messes with Goo Gone Original and return your surfaces to their original condition. Try it on stickers, wax, markers, crayons, glue, tar, window decals, glitter, gum, labels and so much more. There are multiple uses around the house for Goo Gone Original. Everything from wine glass label remover, scuff eraser, window sill cleaner, adhesive remover, tar cleaner, crayon drawing eraser, to glue remover. 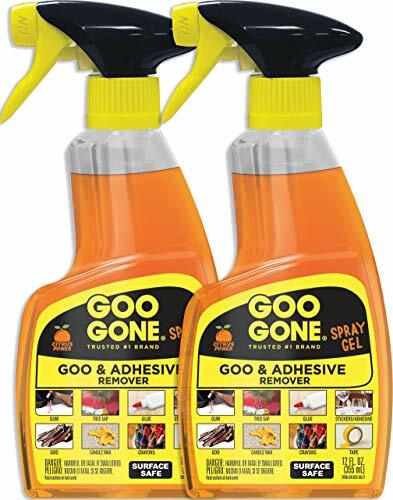 Goo Gone is safe on cars, we suggest to test on an inconspicuous area before using it in full. After you re done, wash the area with hot, soapy water. Do not allow Goo Gone Original to sit on rubber as it can deteriorate it. Keep a bottle or two handy for anything life may throw at you or your walls, floors, cars, etc. You get it, Goo Gone is surface safe so it is a safe alternative to abrasive cleaners that may damage your surfaces. Sit back and let Goo Gone take care of your toughest messes. Remove dried Super glue (cyanoacrylate) adhesive, making it perfect for cleaning up the work area, tools, and spills. 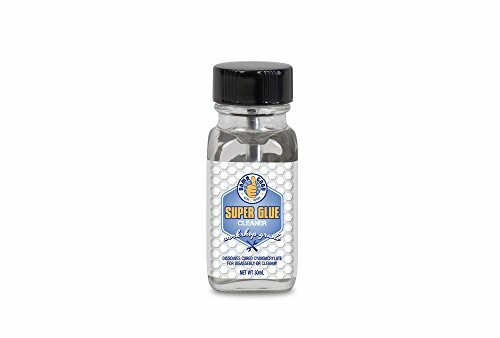 Damn Good Super glue remover - cleaner works by dissolving and softening the dried Super glue so you can simply wipe it up with a shop towel. *Please note: this product is a chemical solvent, care should be taken when using. We suggest trying the product in a discreet area of the affected item to ensure there is no staining, discoloring, damage, or other issue. Apply the product, let it sit for 2-3 minutes, wipe away and check for any issues before Proceeding with its use on the area with the cured adhesive. **Directions: 1. Apply the solvent to a cotton ball or similar so that the cotton ball is wet but not dripping 2. Place the saturated cotton ball on the glue that you want to dissolve 3. Let the cotton ball sit for 2-3 minutes, then wipe or gently scrape away the glue 4. Repeat as necessary. The Goo Gone's line of products is a trusted brand, we stand by our products for all of your dirty, sticky, messes. Safe for you, your surfaces and your home! Please explore our line of Goo Gone Original, Pro-Power, All Purpose, Sticker Lifter, Spray Gel, Patio, Grill, Oven, Automotive, Tile & Grout, Clean Up Wipes, Kitchen Degreasers, Paint and more! There are so many ways to remove tough messes with Goo Gone Products. Goo Gone On The Go Tackles your sticky, gooey messes wherever they are. The convenient pen format makes it easy to take Goo Gone with you. Place the Goo Gone Pen in your purse and you are ready to tackle any mess. Stickers, crayons, and gum don't stand a chance! Keep and on the go pen in your car to remove fun or food from carpets. Perfect for busy parents keeping up with little ones, teachers, crafters, thrifters and more! Try it on stickers, wax, markers, crayons, glue, tar, window decals, glitter, gum, and labels. Keep a pen or two handy for anything life may throw at you or your walls, floors, cars, etc. You get it, Goo Gone is surface safe so it is a safe alternative to abrasive cleaners that may damage your surfaces. Sit back and let Goo Gone take care of your toughest messes. Safe To Use - on ceramic/porcelain, finished wood, painted surfaces, glass, grout, metals and plastics. Removes sticky, gummy, greasy, gooey problems. Safe on hands. 100% organic. Biodegradable. Removes marker mess. Cleans stickers labels, crayons, makeup, ink markers, carpet stains, candle wax, tape residue, pre wash, oil mess, chewing gum, glue, and more. The Goo Gone's line of products is a trusted brand, we stand by our products for all of your dirty, sticky, messes. Safe for you, your surfaces and your home! Please explore our line of Goo Gone Original, Pro-Power, All Purpose, Sticker Lifter, Spray Gel, Patio, Grill, Oven, Automotive, Tile & Grout, Clean Up Wipes, Kitchen Degreasers, Paint and more! There are so many ways to remove tough messes with Goo Gone Products. 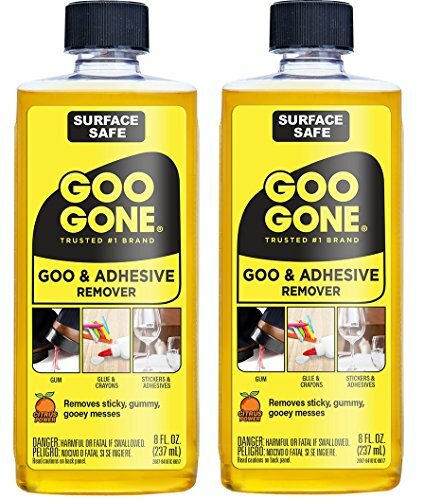 Specifically formulated with Citrus Power, Goo Gone's portfolio of products effortlessly cleans up stains and sticky messes around your entire home. From gum to grease, fabric to fiberglass, you can count on Goo Gone to safely remove almost any problem and restore your surfaces to their original condition. If you can't undo it, un-goo it. Remove sticky, greasy messes with Goo Gone Original and return your surfaces to their original condition. Try it on stickers, wax, markers, crayons, glue, tar, window decals, glitter, gum, labels and so much more. There are multiple uses around the house for Goo Gone Original. 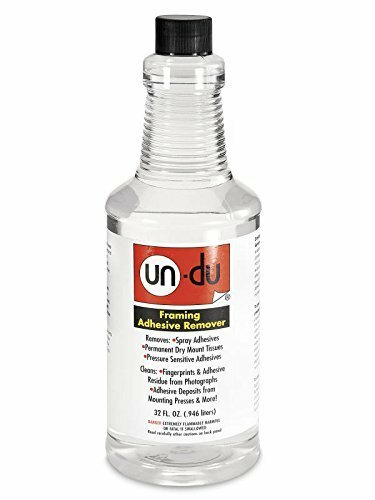 Everything from wine glass label remover, scuff eraser, window sill cleaner, adhesive remover, tar cleaner, crayon drawing eraser, to glue remover. Goo Gone is safe on cars, we suggest to test on an inconspicuous area before using it in full. After you're done, wash the area with hot, soapy water. Do not allow Goo Gone Original to sit on rubber as it can deteriorate it. Keep a bottle or two handy for anything life may throw at you or your walls, floors, cars, etc. You get it, Goo Gone is surface safe so it is a safe alternative to abrasive cleaners that may damage your surfaces. Sit back and let Goo Gone take care of your toughest messes. The Goo Gone's line of products is a trusted brand, we stand by our products for all of your dirty, sticky, messes. Safe for you, your surfaces and your home! Please explore our line of Goo Gone Original, Pro-Power, All Purpose, Sticker Lifter, Spray Gel, Patio, Grill, Oven, Automotive, Tile & Grout, Clean Up Wipes, Kitchen Degreasers, Paint and more! There are so many ways to remove tough messes with Goo Gone Products. Specifically formulated with Citrus Power, Goo Gone's portfolio of products effortlessly cleans up stains and sticky messes around your entire home. From gum to grease, fabric to fiberglass, you can count on Goo Gone to safely remove almost any problem and restore your surfaces to their original condition. It's the formula you love on a whole new level. Goo Gone Pro-Power dissolves even the toughest stains and sticky messes. 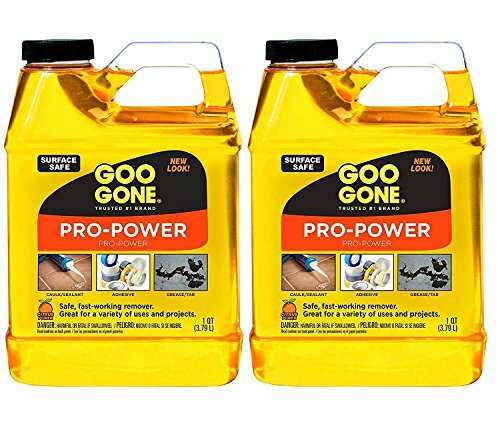 Goo Gone Pro Power is safe on finished wood, painted surfaces, glass, fabric, metals, plastics, ceramic/ porcelain, brass, chrome, fiberglass, grout, and perfect for cleaning tools! The pro power formula works on all type of messes such as silicone caulk, adhesives, sealants, tree sap, wet paint, glue, asphalt, ink, marker, soot, wax, grease and oil. Keep a bottle or two handy for anything life may throw at you or your walls, floors, cars, etc. 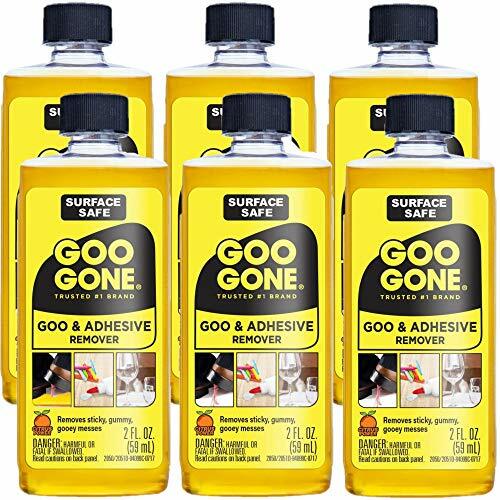 You get it, Goo Gone is surface safe so it is a safe alternative to abrasive cleaners that may damage your surfaces. Sit back and let Goo Gone take care of your toughest messes. This sticker, tape, and label remover is perfect for scrapbooking, hobby crafts, home, school, and office. The acid free and photo safe properties make removing photos and stickers easy, quick, and so safe you can reuse them. It also removes labels, price tags, and much more from paper, plastic, tin, glass, aluminum, fabric, and removes old adhesive from punches, scissors, and laminators. This package contains one 4-ounce/118milliliter bottle with an attached scraper. VOC compliant. WARNING: This product is extremely flammable. Made in USA. 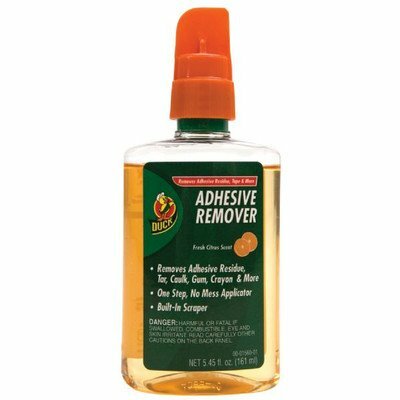 Duck Products - Duck - Adhesive Remover, 5.45 oz. Spray Bottle - Sold As 1 Each - Save time and aggravation by having the right product at hand. - Liquid solution works on duct tape, masking tape, carpet tape, weatherstripping, mounting tape, labels, stickers, gum, tar, caulk and more. - Safe for use on all surfaces. - Sponge applicator for easy and precise application. - Includes built-in scraping tool. Sponge applicator for easy and precise application. Elmer's Sticky-Out Adhesives Remover, 4.5 oz. For more than 65 years, Elmer's Products, Inc. has been providing creative adhesive solutions that support success and turn ideas into reality. PICKS UP GUM - quickly and easily removes gum and other sticky residues from carpet SAFE TO USE - on carpet clothing painted surfaces plastics ceramic porcelain glass finished wood fabric sealed stone and metals. 2 PACK Surface Safe Adhesive Remover Safely Removes Stickers Labels Decals Residue Tape Chewing Gum Grease Tar. If you can't undo it, UN-goo it. Remove sticky, greasy messes with Goo Gone Original and return your surfaces to their original condition. Goo Gone removed stains from carpet, ceramic/ porcelain, finished wood, sealed stone, painted surfaces, glass, fabric, metals, and plastics. 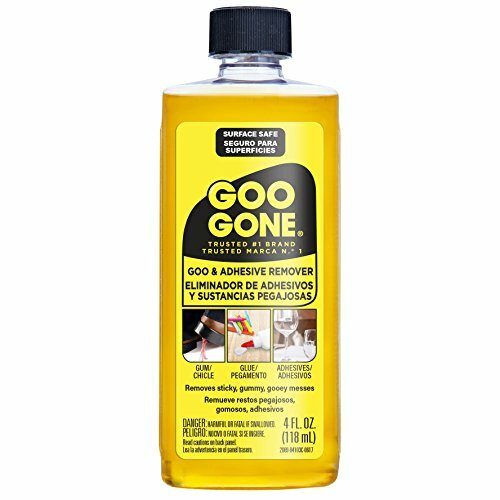 Goo gone is perfect for cleaning clothing, dinnerware and tables. DO NOT USE Goo Gone on silk, leather suede, rubber, faux stainless steel, drywall, unfinished wood surfaces or unsealed stone. Goo Gone is safe on cars, just test on an inconspicuous area before using it in full. After you're done please wash the area with hot soapy water. Do not allow Goo Gone Original to sit on rubber as it can deteriorate it. 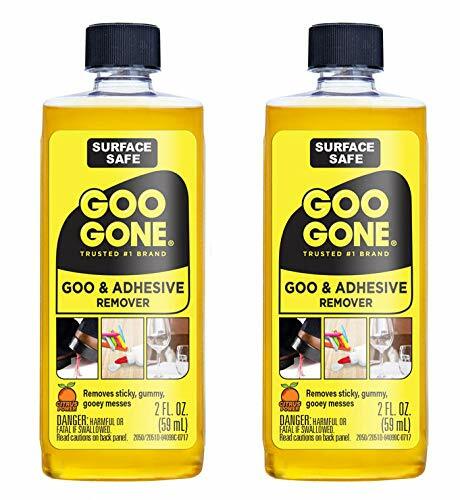 Goo Gone is not food safe, but you can use Goo Gone on a surface which comes in contact with food, please wash the surface thoroughly with soap and water after use. Goo Gone Original is safe on painted surfaces, which means it will not remove any paint. But, our products such as the latex Paint Clean-Up Spray and Wipes WILL remove paint. Goo Gone is safe on fabric, just be sure to pre-test on an inconspicuous area and launder the fabric after using Goo Gone. USE ONLY PER LABEL DIRECTIONS.